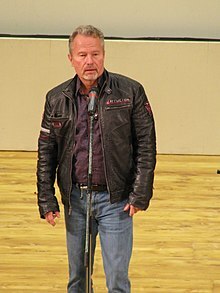 Old Bethpage, New York, U.S.
John Savage (born John Smeallie Youngs; August 25, 1949) is an American actor, best known for his roles in the films The Deer Hunter, The Onion Field, Hair and Salvador. He is also known for his role as Donald Lydecker in the TV series Dark Angel. Savage was born in Old Bethpage, New York, to Muriel (née Smeallie), a housewife, and Floyd-Jones Youngs, an insurance salesman who served on Guadalcanal during World War II with the Marine Corps. His sisters are Boston-based radio and television personality Robin Young and actress Gail Youngs. His brother is actor Jim Youngs. Savage has appeared in more than 200 feature films, short films, recurring roles in television series and guest appearances in episodes of television series. One of Savage's first notable roles is as Claude Bukowski in the 1979 film Hair. His first major film role was as Steven Pushkov in the multiple Oscar-winning 1978 film The Deer Hunter. He also had a lead role in the 1979 film The Onion Field. In the late 1970s, he performed in the Broadway production of David Mamet's play American Buffalo. In 1991, he starred in Italian director Lucio Fulci's final film Door to Silence. He then had a brief role in the 1998 war film The Thin Red Line, portrayed Captain Ransom in the two part episode Equinox of the television series Star Trek: Voyager in 1999, and appeared in the recurring role of Donald Lydecker in the first and second seasons of the 2000 television series Dark Angel. Savage appeared in the recurring role of Henry Scudder in the HBO television series Carnivàle between 2003 and 2005. He appeared in unrelated roles in two of the series in the Law & Order franchise: the 2004 episode "Conscience" of Law & Order: Criminal Intent, and the 2005 episode "Quarry" of Law & Order: Special Victims Unit. Savage starred in the 2015 horror film Tales of Halloween, the 2017 film In Dubious Battle, and on the 2017 continuation of the television show Twin Peaks. In 2018, he appeared on the television show Goliath. In 2018, Savage lent his voice to a monologue on the title track of the album This Town by Steve Smith of Dirty Vegas. In 2017, Savage spoke at a tribute honoring director Richard Donner, held by The Academy of Motion Picture Arts and Sciences. ^ "John Savage". The New York Times. ^ "John Savage Uses Film To Help His Neighbors". The New York Times. February 28, 1988. ^ John Savage profile, filmreference.com; accessed October 5, 2016. ^ "John Savage Biography (1949?-)". Film Reference. Retrieved June 18, 2015. ^ Denby, David (March 19, 1979). "'Hair' Transplanted". New York. Retrieved February 7, 2019. ^ Muir, John Kenneth (2007). The Rock & Roll Film Encyclopedia. Hal Leonard Corporation. ISBN 978-1557836939. ^ Deal, David (October 18, 2011). Television Fright Films of the 1970s. McFarland. ISBN 978-0786455140. ^ Hischak, Thomas S. (July 9, 2012). American Literature on Stage and Screen: 525 Works and Their Adaptations. McFarland. ISBN 9780786492794. ^ Mamet, David (July 22, 2014). American Buffalo. Grove/Atlantic, Inc. ISBN 978-0802191809. ^ Winick, Margot (January 1, 1996). Spaghetti Nightmares: Italian Fantasy-horrors as Seen Through the Eyes of Their Protagonists. Fantasma Books. ISBN 978-0963498274. ^ Patterson, Hannah (November 19, 2007). The Cinema of Terrence Malick: Poetic Visions of America. Columbia University Press. ISBN 978-0231850117. ^ Ruditis, Paul (2003). Star Trek Voyager Companion. Simon and Schuster. ISBN 978-0743417518. ^ Garcia, Frank; Phillips, Mark (September 27, 2013). Science Fiction Television Series, 1990–2004: Histories, Casts and Credits for 58 Shows. McFarland. ISBN 978-0786491834. ^ Terrace, Vincent (November 12, 2012). Encyclopedia of Television Shows, 1925 through 2010 (2d ed.). McFarland. ISBN 978-0786486410. ^ Stevens, Dennis J. (April 19, 2011). Media and Criminal Justice: The CSI Effect. Jones & Bartlett Publishers. ISBN 978-1449658120. ^ Harvey, Dennis (October 20, 2015). "Film Review: 'Tales of Halloween'". Variety. Retrieved July 11, 2018. ^ Nordine, Michael (August 29, 2016). "'In Dubious Battle' Trailer: James Franco Takes on John Steinbeck in His Latest Literary Adaptation". IndieWire. Retrieved July 11, 2018. ^ Collins, Sean T. (August 7, 2017). "'Twin Peaks' Recap: In Arms' Way". Rolling Stone. Retrieved July 11, 2018. ^ "235: John Savage". ART19. Retrieved July 11, 2018. ^ "An unlikely trip from Dirty Vegas to the South Shore". The Boston Globe. August 19, 2007. Retrieved July 11, 2018. ^ Thompson, Melissa (June 2, 2017). "THE GOONIES, SUPERMAN, LETHAL WEAPON Filmmaker Richard Donner Gets Tribute By The Academy June 7". We Are Movie Geeks. Retrieved February 7, 2019. ^ "7E". IMDb. Retrieved February 7, 2019. ^ "John Savage". IMDb. Retrieved July 11, 2018. This page was last edited on 8 April 2019, at 04:58 (UTC).